The Bank of Canada held interest rates at 0.5 per cent Wednesday but it was events elsewhere in the world that remained in focus. Geopolitics and comments from President Trump that the greenback is too strong subdued most equity indexes, along with a decline in oil prices as data showed a rise in US inventories. The main TSX index weakened as the energy sector slipped along with five others including the heavily-weighted financial group as bank investors weighed the interest rate decision. The strongest sectors were IT and telecoms. Wall Street closed lower too along with most European indexes; Asian bourses were mostly higher but Japan and Shanghai were lower. 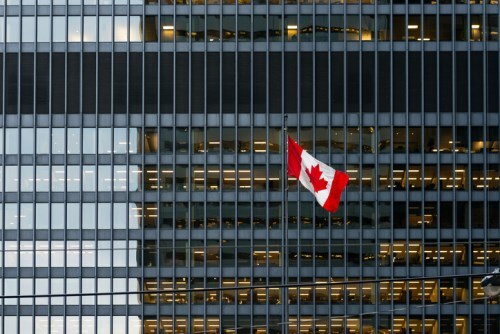 Canada’s economy is set to moderate in 2018/19 but remains “above potential” and on a “sustainable path growth” the BoC governor said Wednesday. Stephen Poloz gave the bank’s assessment of the economy following the announcement that interest rates have been held at 0.5 per cent. He said that the growth so far this year had been “uneven” with consumer spending and the housing market, coupled with higher-than-expected investment from the oil and gas sector, driving growth. Exports and non-commodity business investment were weak though. The BoC now expects GDP to grow by 2.6 per cent this year (up from the 2.1 per cent it forecast in January) and then 1.9 per cent in 2018 and 1.8 per cent in 2019. There was the largest jump for the Teranet-National Bank House Price Index in March in more than 10 years. The index was up 13.5 per cent as prices in Hamilton, Toronto, Vancouver and Victoria gained strongly year-over-year. For the month, the index gained 0.9 per cent with Hamilton and Toronto leading the gains. Ottawa-Gatineau, Calgary, Halifax, Edmonton and Quebec City all saw prices decline.